Q – Why are so many aircraft flying low and loud over Palo Alto? A – SFO is transitioning to a new air traffic control system known as “NextGen“. The FAA kicked-off the three-year roll-out of “NextGen” at SFO in January 2013. Under “NextGen”, aircraft will descend into SFO from altitude at high speed along several precisely navigated three-dimensional approach routes. 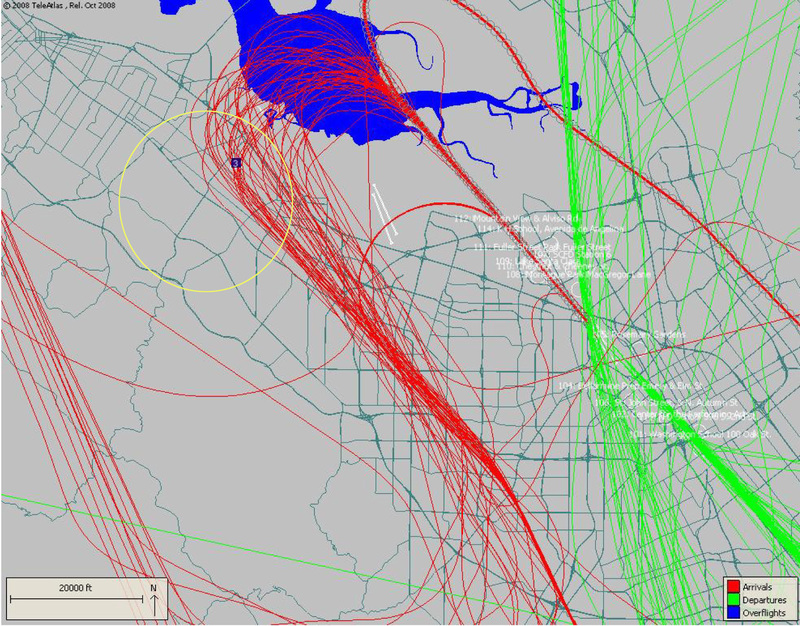 The precision navigation used in the “NextGen” system channels air traffic into several narrow flight paths on their way into SFO. While the “NextGen” approach may slightly reduce the noise emitted by an aircraft’s engines, residents living under a “NextGen” approach route will experience an increase in noise at ground level due to the greater number of aircraft passing overhead in concentrated flight paths. The FAA has called the “NextGen” air traffic system “highways in the sky”. Under the prevailing westerly wind pattern there are five highways into SFO. Three of these highways pass over Palo Alto and then converge over northern Palo Alto on their way to SFO. Q – What is SFO? A – SFO is a for-profit corporation owned and operated by the City and County of San Francisco. Profits from the operations of this industrial facility (SFO) go into the City and County of San Francisco’s general fund, and the toxic waste products (noise and air pollution) are dumped on the people living in cities under the departure and arrival routes. Of the nine routes into and out of SFO, only one crosses over San Francisco, at over 10,000′. Q – Where will the NextGen highways be located? A – The FAA has been overlaying the NextGen routes over the existing routes, so they can say “the routes have not changed”. In practice, the actual paths that aircraft take through the skies are changing. Under the older navigation system, aircraft were only able to fly a vague approximation of the published air routes, which spread the traffic over a larger geographic area. With NextGen navigation, aircraft will be able to precisely follow the published route starting at up to 200 miles out from an airport. Q – I have noticed the increase in noise, but are the planes also causing air pollution? The five major air pollution species which comprise the most significant emissions from commercial jet aircraft are volatile organic compounds (VOCs), carbon monoxide (CO), oxides of nitrogen (NOx), particulates (PM), and sulfur dioxide (SO2). VOCs and CO emissions are highest when engines operate at lower power settings, such as when they are idling, taxiing, or flying a NextGen approach at reduced power. Conversely, NOx emissions rise with increasing power levels and combustion temperatures. In the first study of its kind, experts from Carnegie Mellon University in Pittsburgh collected pollution from a commercial jet as it operated at various reduced throttle setting from idle to 30%. They found microscopic droplets of unburned jet fuel in the exhaust; when exposed to sunlight, these droplets broke down into an even greater number of smaller particles that were able to penetrate the lungs and blood-brain barrier. They contained aromatic hydrocarbons like benzene and toluene which are known carcinogens. Q – How high are the aircraft flying over Palo Alto, and are they flying lower? A – The aircraft flying the the three approach routes that converge over Palo Alto on their way to SFO, are all heading for a rendezvous point in the sky located near the intersection of highway 101 and Willow Road called the Menlo IAF, where they begin final approach to SFO. The current target altitude for the Menlo IAF is 4,000′, and in practice it varies from 3,800 to 4,200′. In the year 2000 the late mayor of Palo Alto Gary Fazzino and Anna Eshoo negotiated an agreement with the FAA and SFO to maintain a minimum altitude of 5,000′ at the Menlo IAF, but sometime in the last several years the FAA and SFO unilaterally decided to stop honoring that agreement without informing the city of Palo Alto or Anna Eshoo of the change in policy. 1,000′ might not seem like a big change in altitude, but aircraft noise doubles with every 1,000′ reduction in altitude. Q – The FAA says NextGen will make the airspace more efficient; isn’t that a good thing? A – By more efficient, the FAA means they will be able to cram more aircraft into the existing finite airspace by channeling a gradually increasing number of commercial air traffic into several narrow routes into, and out of, an airport, thereby opening up large amounts of airspace for other aircraft that are not operationally compatible with piloted aircraft. The FAA calls these aircraft Unmanned Aerial Systems or drones, and they vary in size from quite small to the size of a small airliner. The net result of more aircraft in the skies is more noise, more fuel being consumed, and more air pollution. Q – How much does NextGen cost, and who is paying for NextGen? Q – How can this problem be solved without pushing the problem onto another community? A – The aircraft must fly higher to reduce the impact of noise at ground level, they must return to flying a spread-out pattern which shares the the problem more equally among everyone living on the ground, and we need a nighttime curfew. The commerce generated by a handful of flights, flying mostly freight into SFO between the hours of midnight and 6:00am, does not outweigh the the lost productivity due to sleep disruption–and health costs–of millions of people living on the ground. Q – How many aircraft are flying over Palo Alto, or my neighborhood every day? A – It’s complicated, but these flight-track maps from late May and early June of 2014 might help answer your question. Q: Does San Jose Airport (SJC) commercial jet traffic affect Palo Alto too, or is it only SFO? A: While SFO represents the largest number of commercial jets flying above Palo Alto, Palo Alto is also affected by SJC flights. Q: What kinds of SJC flights affect Palo Alto? A: Palo Alto gets two kinds of SJC flights, departing flights on their way to Hawaii on most mornings, and arriving flights when the prevailing winds reverse directions. Q: Can you tell me more about the departing flights from SJC flying above Palo Alto? A: Daily, there are 4 or 5 departing flights from San Jose, heading to Hawaii in the morning. They head west over Mountain View or Palo Alto. Q: Why are these flights an issue? A: These flights arrive in Palo Alto at 5,000 feet in the best case scenario. They are climbing while above Palo Alto, which means their engines are near full power. As a result, they make even more noise than landing planes flying at the same altitude. Additionally, these departing flights sometimes fly even lower because they have to stay below incoming SFO traffic that is also above the area at the same time. This could potentially be a safety issue, but the immediate result is that these departing flights from SJC are very loud, even though they are not numerous. Q: Why would we get incoming flights bound for SJC flying above Palo Alto? A: Normally Palo Alto does not get incoming SJC traffic. However, we do when the prevailing winds change directions. This happens about 15% of the time at SJC and the phenomenon is called “reverse flow”. This reverse flow pattern typically takes place during stormy weather, but also often on summer mornings and late nights. 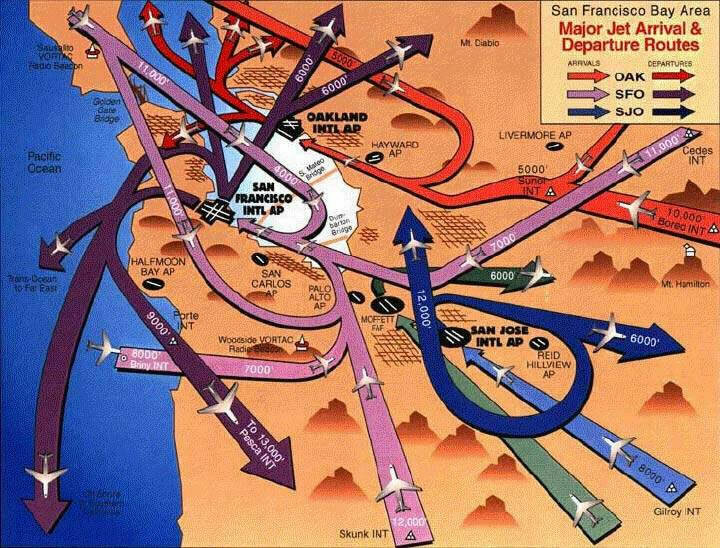 At such times, instead of flying to the north into San Jose (“normal flow”), planes will land to the south into San Jose, after doing a loop flying northward to Palo Alto Mountain View or northern Sunnyvale, and then turning south over the bay. Furthermore, this reverse flow can happen at SJC even while SFO traffic is in its normal flow, which then means that Palo Alto receives incoming traffic for both SFO and SJC simultaneously. 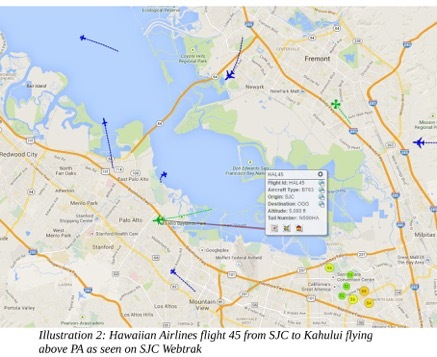 Q: Why are these SJC planes in reverse flow an issue for Palo Alto? A: We are only 15 miles from SJC and such planes will be low when above Palo Alto in any case. Worse, when they are above Palo Alto simultaneously with SFO bound traffic, SJC bound aircraft have to stay under SFO bound flights. As a result, they typically fly above Palo Alto at a very low altitude of between 1,900 and 3,000 feet, and are extremely noisy. They usually mostly affect all of Palo Alto east of Alma and the train tracks. If you look at the graph in Illustration 1 below, you will see a typical example of a reverse flow pattern for SJC incoming flights. The red tracks represent all of the SJC arrivals from 6:00 AM to 11:00 AM on August 20, 2014. The 3 in a little purple box on the graph represents a location in Midtown Palo Alto. Q: How can I know that an aircraft above my house is arriving in or departing from San Jose? In this website, flights departing from San Jose are depicted with green tracks, those arriving in San Jose are shown as red tracks. Flights are usually shown on the website with an eleven minute time lag. You can also consult historical data. Q: What do I do if a flight into or out of San Jose Airport is disruptive for me or my family? A: You are strongly encouraged to report the aircraft to the SJC airport. This may not result in any immediate action, but it will serve to document that SJC flights negatively impact Palo Alto. Q: How do I report a loud flight to the San Jose Airport? Using the tools on the website, look up and find the flight that was disruptive to you. Click on the airplane icon of the flight in question. A box will appear with information on the flight. In the bottom left corner of this box, there is an icon representing a pencil and a pad (see Illustration 2 below). Click on this icon. It will ask for a confirmation that you want to report the flight or a more general complaint, then take you to a screen where you enter your complaint. Just follow the instructions.